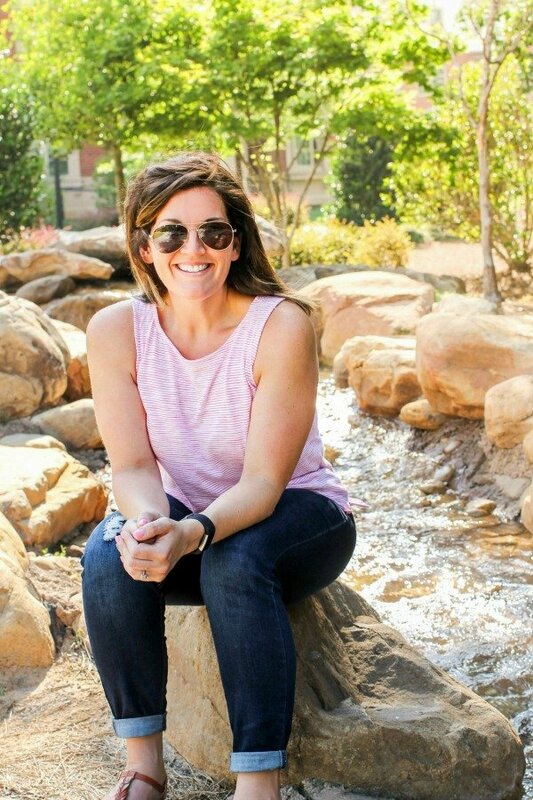 February 22, 2017 By Allyson 5 Comments This post may contain affiliate links. Read my disclosure policy. 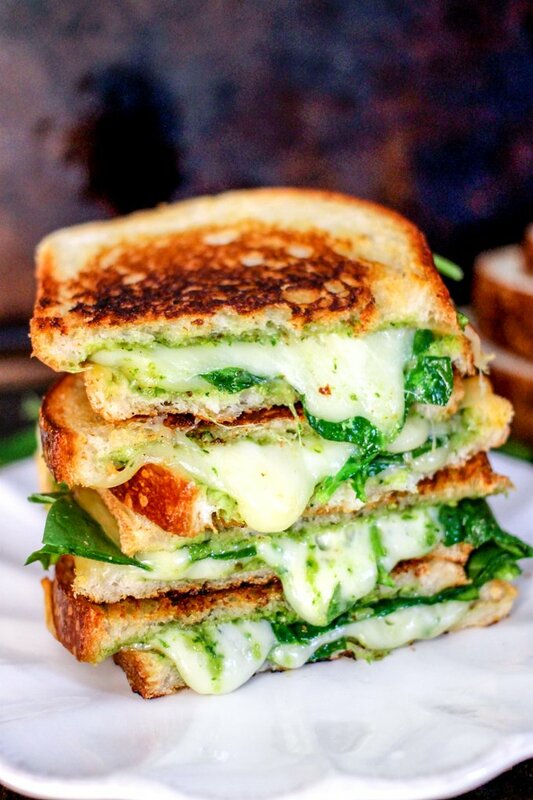 Spinach Pesto Grilled Cheese is stuffed with delicious smoked gouda cheese, spinach, and a homemade spinach pesto – it’s to die for! Anyone who knows me knows that I love me some cheese. Grilled cheese, cubed cheese, blue cheese, herbed cheese, fried cheese, straight up cheese from the package….. I have never met a cheese that I didn’t like, ever. I often think about how I could spice up my grilled cheese aka the perfect sandwich. Often I use pesto on my sandwiches, but since I didn’t have any basil, I thought maybe I could make a spinach pesto. Turns out I was right and pretty much hit the jackpot with this winning combination. 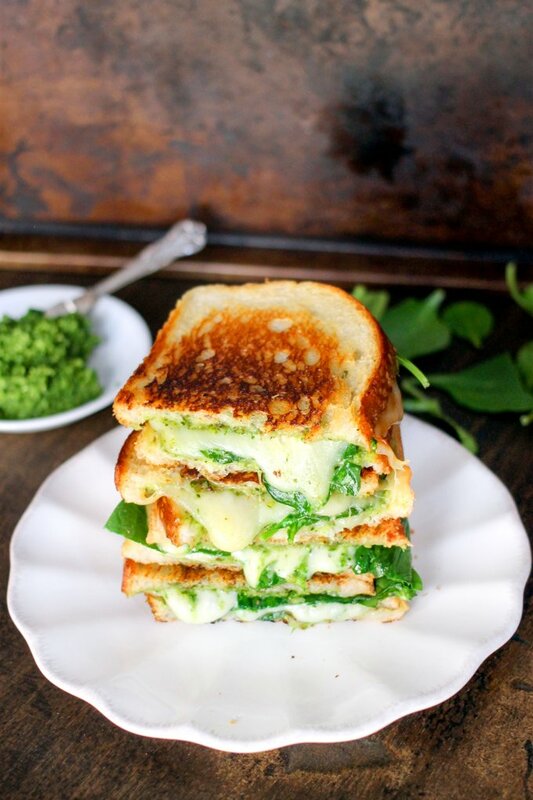 You have to try this Spinach Pesto Grilled Cheese, it’s to die for! 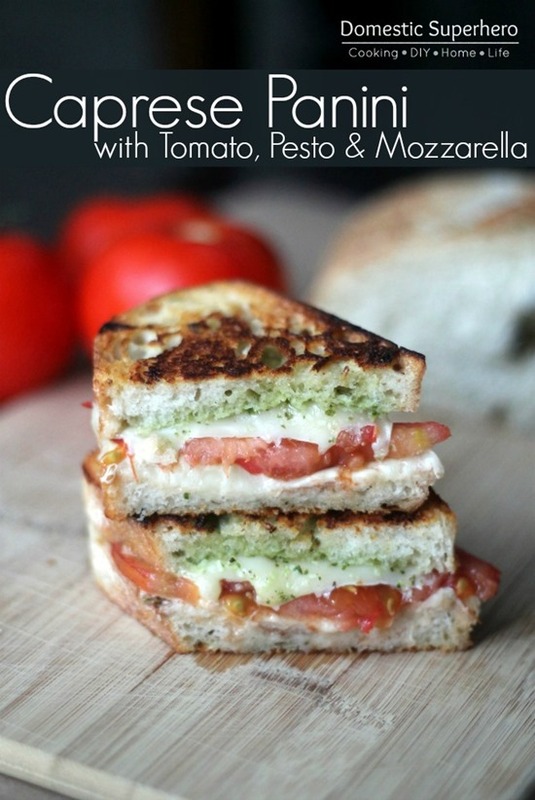 So, if you are a big fan of grilled cheeses, like I am, then you are going to need to try this one. 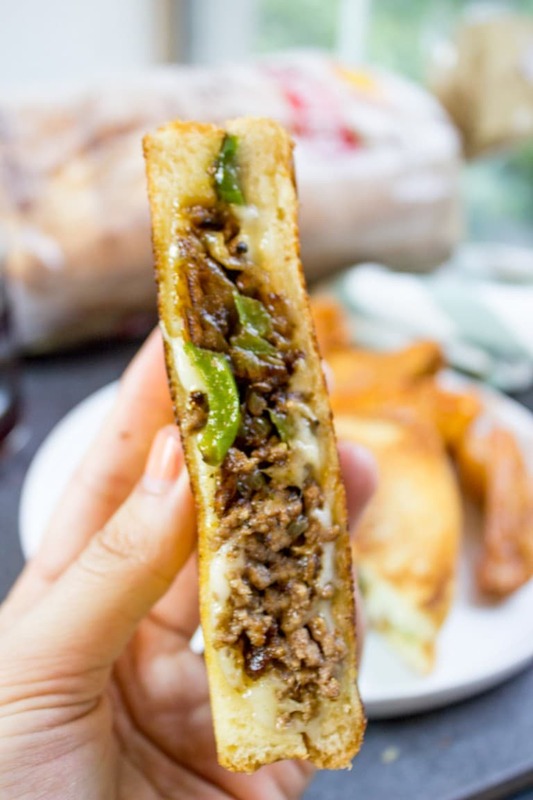 I have posted a lot of grilled cheeses on Domestic Superhero – Caprese Grilled Cheese, Mushroom & Caramelized Onion Grilled Cheese, Gluten Free Buffalo Chicken Grilled Cheese, BBQ Chicken & Pineapple Grilled Cheese…and the list goes on…I am telling you, I love grilled cheese! 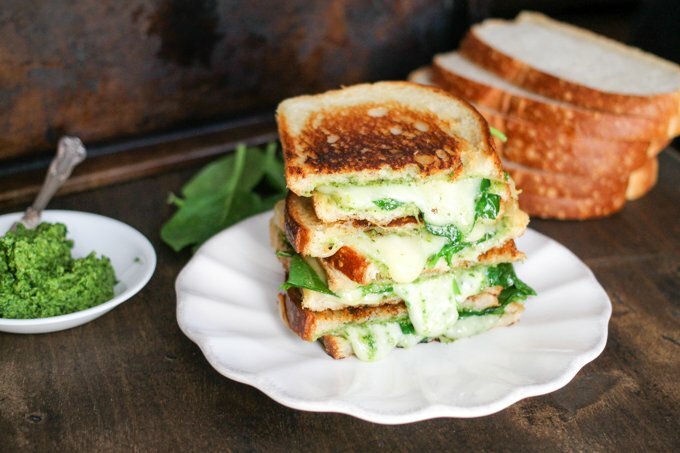 For this Spinach Pesto grilled cheese, it’s actually really simple and you only need a few things. Get together some spinach, crusty bread, olive oil, nuts, parmesan cheese, salt, pepper, and delicious smoked gouda cheese. Oh, and butter…you can’t forget the butter! Butter is essential when making grilled cheese; you HAVE to slather the bread with butter in order to get a nice crispy brown outside. Don’t skip this step!!! Add all ingredient for pesto (abovin a food processor or blender, blend until smooth, scraping sides down if needed. Set aside. Set out 4 slices of bread and butter the outside facing sides. 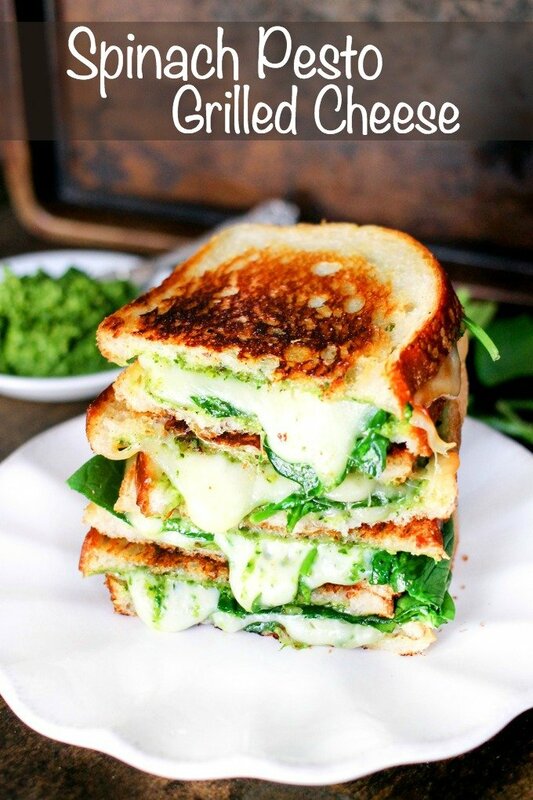 On the inside of the 4 slices, slather spinach pesto (about 2 TBS per side), then top with 2 slices of gouda on half. Add 1/4 cup baby spinach leaves, then place 1 piece of gouda on top, and place the remaining slice of bread on top (spinach pesto side down, butter side up). Repeat for second sandwich. In a skillet over medium heat, place sandwiches and cook for 3-5 minutes, or until bottom is browned. Watch closely as you don't want to burn them, but you want the cheese to start melting. Do not turn the heat to high! Flip sandwiches and cook for 1-2 minutes on opposite side (will cook faster), remove, cut in half and serve immediately! **See 1 minute how-to video for a visual explanation of making the sandwiches! Makes 2 sandwiches. If you have leftover pesto, use for chicken, pasta, fish...it's delicious! If you like grilled cheese as much as I do, you are definitely going to want to check out these grilled cheeses! This looks divine! Cheese is such an achilles heel to any time I think of completely going vegan. My mouth is watering. Drool. Drool everywhere. This looks like PERFECTION! 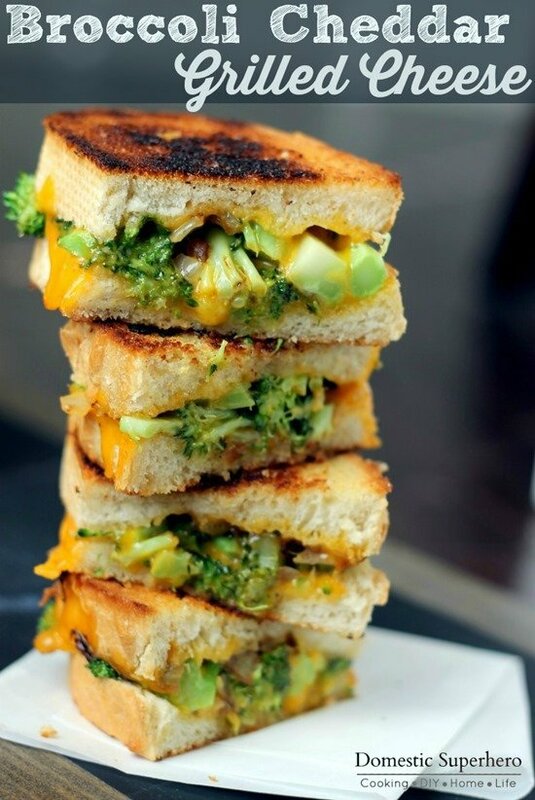 Pesto on a grilled cheese is just genius! It is so simple, and so delicious!!! !